She’s been Scouted, she’s been one of Cville’s Best, and now she’s the latest Artist Check-in! 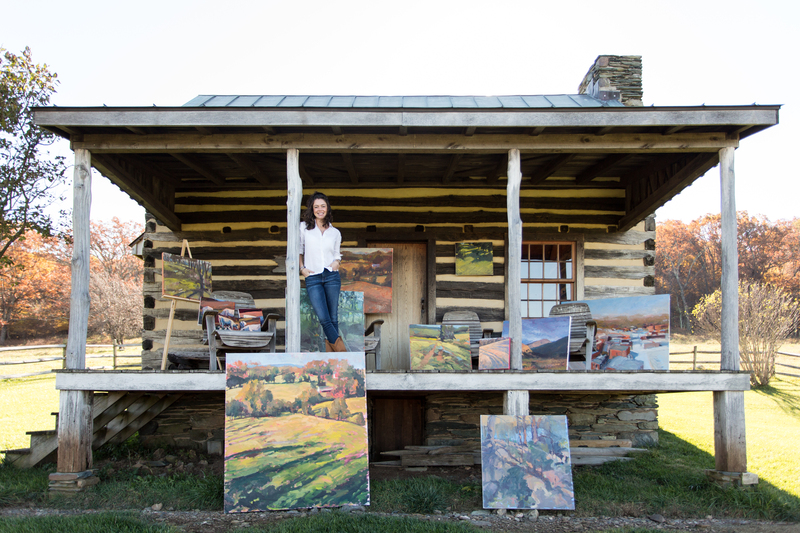 Get to know Isabelle Abbot, a beloved life-long local whose oil paintings have been a Cville staple since her days as a student in the UVA Art Department. You’ll be initially captured by her bright palettes and scenic outdoor landscapes, but will stay for the familiar views. Abbot’s art has been on display at Cville favorites such as Les Yeux du Monde Art Gallery and The McGuffey Art Center, and her skills have been shared throughout the community in her various art classes. You can always visit Abbot at her gallery in The McGuffey Art Center, but don’t miss her show “A Take on Spring” this Friday at The WVTF and Radio IQ Studio Gallery for the New City Arts May First Fridays Opening! Come for the art, stay for the Feast! and wine. Tell us a little about yourself. Where are you from? If not Cville, when did you come here? I was lucky to be born in Charlottesville and grew up here. I’ve lived away for a year or two at different times in my life, but was always happy when I got to move back home. I’ve always drawn and painted. When I was little, we did a lot of watercolors and pastel drawings. Now, I work pretty exclusively in oil paint, although it’s always fun to mix it up and do some watercolor or gouache. Matisse. Rothko. Richard Diebenkorn and Joan Mitchell. Very simple, day-to-day things are always the most inspiring and significant to me. The clear air on a Spring evening, a bowl of fresh berries, the smell of leaves and dirt. I read a lot and that informs my paintings, even more than looking at other artists’ work. It helps my brain register rhythm and detail and somehow translates into a visual language when I’m out painting. I want people to look at my work and see something familiar, a place that they’ve been, even if they can’t pinpoint specifically where or when it was. 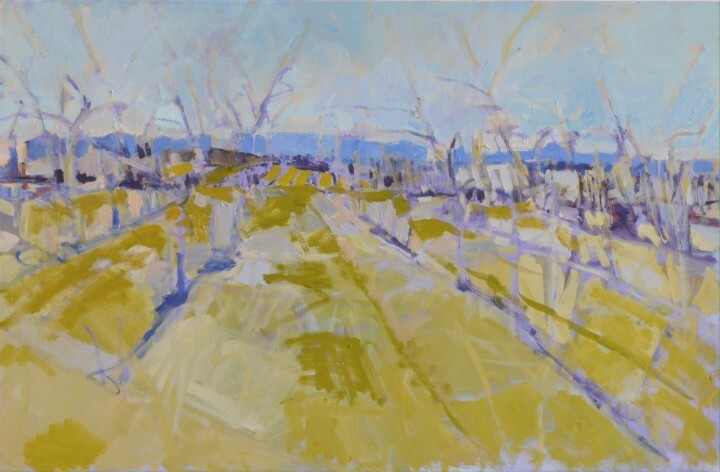 That feeling of connection and triggered memory are what I experience in the landscape, so I want my paintings to give my viewer that same experience. A lot of busy work- building canvases, updating websites, checking in with galleries; and then finally the still hours of actual painting. This town truly appreciates creativity in all its manifestations. It’s wonderful to live in that kind of environment. Plus, the University and all the galleries offer so many opportunities to connect with other artists, which is rare for a town this size. And the natural beauty here is so inspiring. The countryside in Western Albemarle. Les Yeux du Monde and Second Street Gallery. There are so many great places! I get lunch at Rev Soup almost daily. Greenwood Market. Everything they make is so delicious. What does the not-so-distant future hold for you and your art? After this show, I have an exhibit at Bridgewater College in the Fall. This will be my first show at a College and I’m excited for the new environment. What pieces should we look forward to at your upcoming May First Fridays installation with New City Arts? It’s hard to single one out. I feel like I learn something new from each piece. “A Hint of Spring in the Orchard” is a favorite and “The Edge of the Orchard” feels like something new and exciting. Lastly… Describe yourself in 10 syllables. Trying to live each moment by painting.